If you want to explore the Greek Dodecanese Islands and some of the most appealing cities in the “Turkish Riviera”, then this is the itinerary for you. You will embark in Bodrum, the ideal starting point for chartering a catamaran, sailing boat or gulet, and you will finish your boat trip in Marmaris, an important tourist destination located in southwestern Turkey. Along the way, you will discover the islands of Kos, Symi and Rhodes and all the wealth of the Aegean Sea. It’s a paradise for scuba diving and snorkelling lovers. Bodrum, the ancient and mythical Halicarnassus, is today a city with a bohemian feel and a lively nightlife with dance clubs open until dawn. 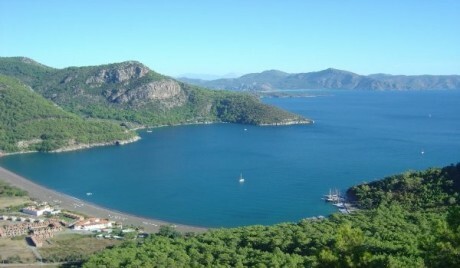 However, Bodrum offers visitors much more than this. History lovers will gaze in awe at the Castle of Saint Peter which was built by the Knights of Rhodes during the Middle Ages to protect the bay. In the markets and bazaars, souvenir seekers will find an unbelievable array of articles from natural sponges to kilims, sandals, broidery and original cotton pieces. Kos, only 4 kilometres from Bodrum, is one of the largest islands in the Greek Dodecanese. It’s worth disembarking and visiting the Sanctuary of Aphrodite and the ancient Agora located in the centre of the capital, Kos. However, if you prefer, we can anchor our catamaran in any of its beautiful beaches (Paradise, Ayios Stefanos in the southeast or Ai Loani and Tigaki in the north) and immerse ourselves in a good book on the deck. We can't leave the island without visiting the thousand-year-old tree that, according to local tradition, Hippocrates himself planted and was the spot where he conducted his classes. One of the advantages of chartering a boat is that every day we can see the sun rise in a different place yet always with the sea as a backdrop. On our third day, we will wake up in Knidos, a town located on the end of the Datça Peninsula. Knidos was an ancient Greek city of Anatolia and today it preserves many ruins such as the Temple to Aphrodite, part of the walls and the two harbours, two theatres and the remains of a large building which was probably a temple dedicated to the sun god. Symi Island, located in the south of the city of Knidos very close to the Turkish coast, is without a doubt one of the most picturesque Greek islands. Many of its beaches are only accessible by sea. Depending on the season we're out cruising in a sailing boat, it's quite possible that we will be swimming on a deserted beach with only the fish for company. Back in Turkey, this time we are in Datça, a city that stands out for its lively array of entertainment options. Its bustling port offers a wide range of shops and a good selection of restaurants and bars where we can taste some delicious dishes. The nightlife is also very active and you are sure to be entertained until the break of dawn. If you feel like dancing or going out for drinks, then mooring the boat in Datça would be a good idea. Rhodes is the largest island in the Greek Dodecanese. We can’t miss a visit to its capital, a walled city dotted with Medieval palaces, mosques and Greek temple ruins. We can round off this panorama of contrasts with a visit to Lindos, a beautiful town of whitewashed houses that will appear before our eyes as we cruise in our boat towards the south of the island. Tip: If you go to the top of the Acropolis (on foot or by donkey) you can marvel at one of the most famous postcard images of Greece. Don’t forget your camera! After a relaxing week cruising in gulet (or other type of boat), we will disembark in the Turkish city of Marmaris, an important tourist destination located in the southwestern part of the country. There’s not much left of the small fishing village that Marmaris used to be only a couple of decades ago. Today it has two important marinas and other smaller marinas making it one of the most solicited Turkish cities in terms of yacht, catamaran, gulet and sailing boat charters. *The itinerary is only a guideline. Errors in the content do not justify grounds for filing a legal complaint. If you want to visit other places, the itinerary can be modified according to your preferences. If chartering a boat with skipper, the skipper may decide to change the planned itinerary due to unexpected and/or unrelated causes to the organisation.